Happy Thanksgiving all! (Obviously Canadian. lol) 😀 The awesome thing about Thanksgiving is that you still get to eat all the delicious food without having to spend any money on presents! This year however, I wanted to do all the cooking and host a little Thanksgiving shenanigan for my besties and sister. Since it was my first time, I thought I’d go with the traditional Turkey + gravy and mashed potatoes kinda deal. The thought of making the turkey was quite intimidating since I have never even attempted to roast a whole chicken before. And thus, it was decided that I conquer my fear of popping the holiday bird into the oven. Anyway, I’ll provide the original recipe here. The only change I made was to turn up the temperature and I think that’s what made my turkey burn a little, but it was still nice and crispy on the outside! I was definitely rushing the dinner because I only had 4 hours to finish everything before my guests came. And yes, that includes turkey, mashed potatoes, stuffing, gravy AND cheesecake. My cheesecake and turkey were in the oven together at some point too! Thank goodness the cheesecake didn’t have a hint of “turkey-ness” in it! Position oven rack in bottom third of oven. Preheat to 325F. Place a rack in a roasting pan. 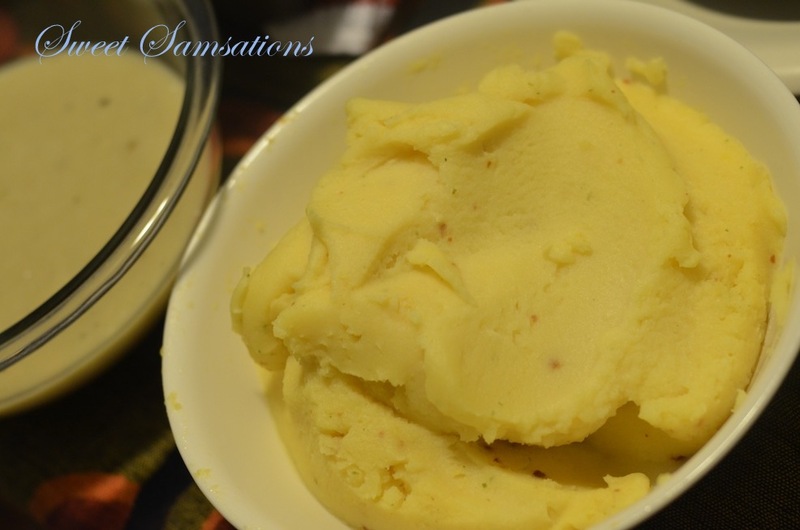 Stir butter with herbs and salt in a small bowl. Wash and dry turkey well. Reserve giblets. Rub herbed butter underneath and over skin of turkey. Transfer turkey to rack in pan. Bend and tuck wings under the bird and loosely tie drumsticks with twine. Pour sherry into pan along with 1/2 cup water. Add carrot and celery sticks. Cover loosely with foil. Roast in bottom third of oven for 2 hours, basting regularly every 1/2 hour. After 2 hours, remove foil and brush turkey with maple syrup. Continue roasting, uncovered, until a meat thermometer inserted into thickest part of thigh reads 175F, about 1 more hour, for a total cook time of about 15 min per 500 g. Transfer turkey to a cutting board. Tent loosely with foil and let rest at least 25 min before carving. Place giblets in a medium saucepan. Cover with water. Add onion, bay leaf. Bring to a boil, then reduce heat to low. Simmer, uncovered, 30 min. Strain and save liquid. Discard giblets. Skim off any fat floating on pan juices. Place pan over 2 burners or pour juices into a medium saucepan. Bring to a boil over medium. Sprinkle in flour while whisking constantly, until smooth. Whisk in 2 cups giblet or chicken broth. Whisk until thickened, about 5 min. For next time, I’d try to flip the turkey after roasting it for the first hour. I found the bottom of the turkey SUPER juicy and delicious!! The top was cooked thoroughly but a tad dry. Still good though! Do you guys usually flip your turkeys?? I made my stuffing separately since I barely had time to stuff the turkey! A stuffed turkey would also mean prolonged bake time and time wasn’t on my side that day. 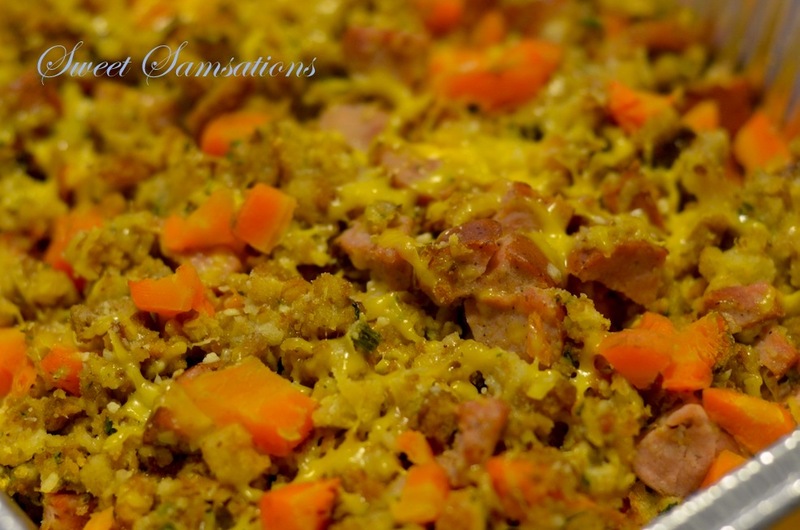 I added some garlic sausage and shredded cheese to my stuffing, and baked it 10 minutes before my friends came!! Of course there would have had to also some mashed potatoes on thanksgiving! 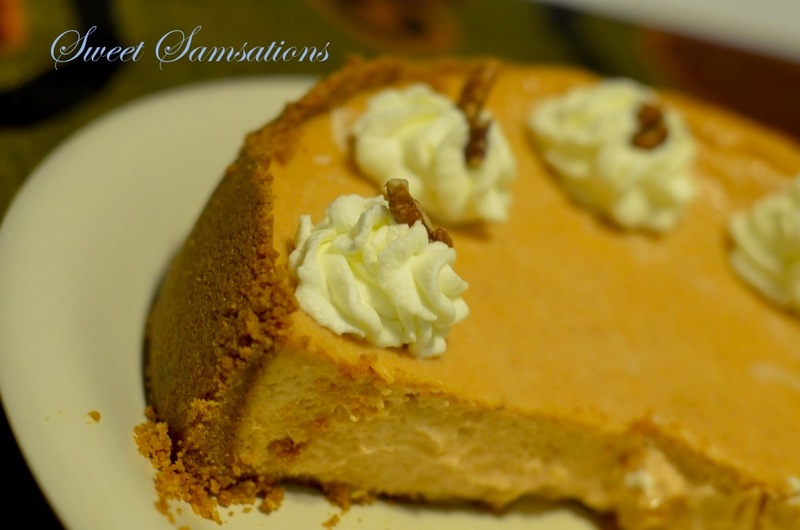 Here’s the pumpkin cheesecake that I made last year. I’ve made it last year for thanksgiving too and absolutely love it! It was nice having my friends over! Like me, they live away from their families as well and it was really lovely to be able to spend the day with my closest people! Everything was delicious and made with love (right?) 😉 Amazing first-time turkey, hunn. Be proud! Hey, Sammie!! You have made me wanna do a trial run for Thanksgiving!!! Everything looks great! I think roasting a turkey is super intimidating… I’ve never had any trouble, it just seems scary. Your turkey looks amazing!!! 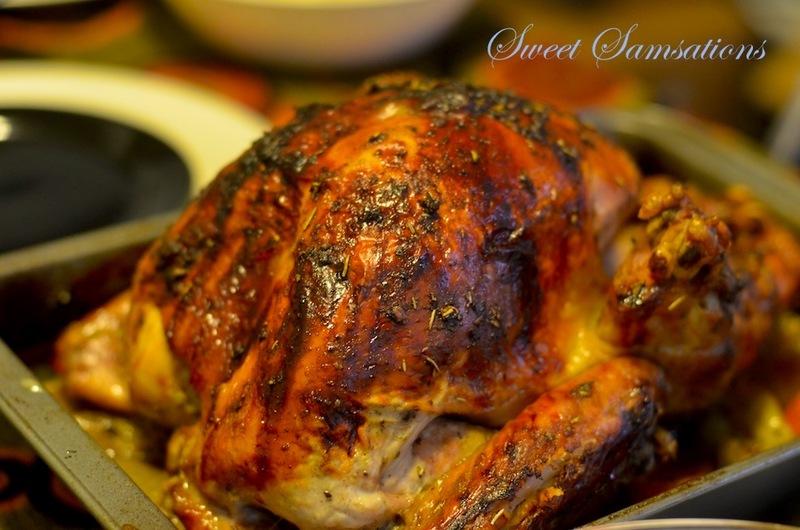 Sammie, your turkey looks perfect and so flavorful with herb and the sweetness of the maple. You are ready for Thanksgiving! Aww I still remember the first Thanksgiving I ever cooked – it was super intimidating (lol and I’m acting like it was forever ago when it was actually only 3 years ago). That turkey looks so deep, rich and gorgeous. The food looks outstanding! So looking forward to Thanksgiving! The turkey looks really delicious! And wow you’re amazing, baking and cooking so many things in 4 hours! I don’t think I can ever do that, I’ll be too flustered! What a lovely Thanksgiving meal + congrats on such a wonderful-looking first turkey! You did a fantastic job! I think I just drooled all over my keyboard! That is one of the most gorgeous and delicious looking turkeys I’ve ever seen! I LOVE the maple! I think I’m going to make the turkey this year and this one may be it!! I cannot believe it’s your first turkey! Great profile you’ve got here, Sam! Such a fun & interesting post. 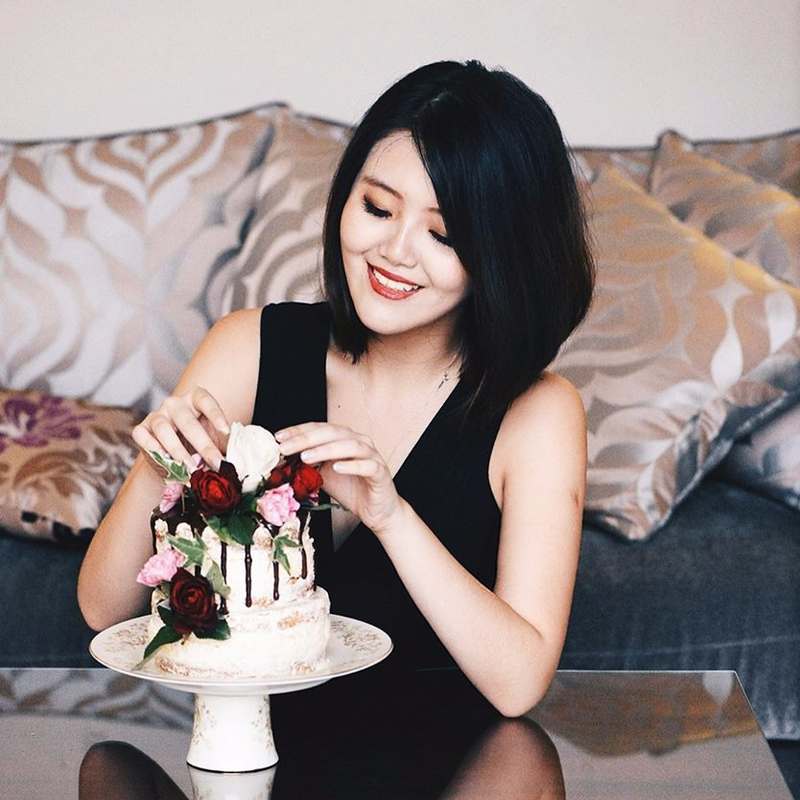 I’m glad I stumbled upon your blog 🙂 I’m dropping by from Shirley’s Luxury Haven, a Lifestyle Blog by an ex-Flight Attendant. 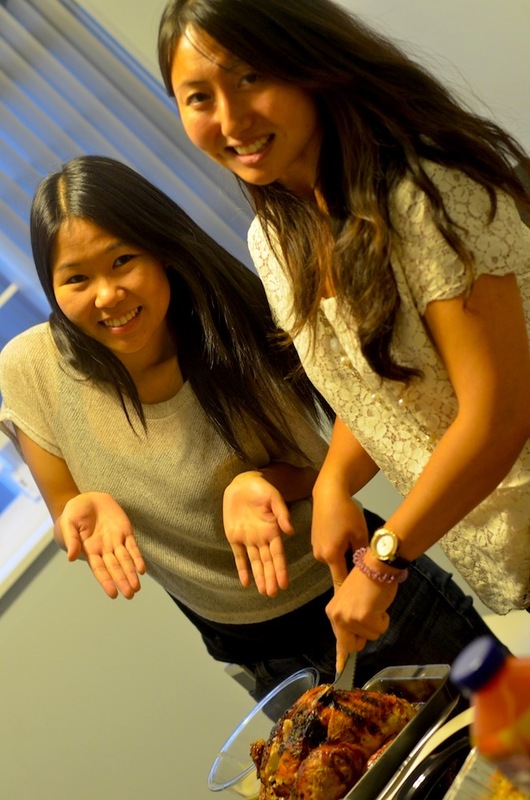 Looking fwd to sharing, not just on our cooking! Making a perfect turkey is truly no easy feat! AWESOME job! What a fantastic feast! The turkey looks amazing. Happy Thanksgiving! What a terrific holiday meal! The turkey looks amazing. Oh, I am now SO ready for Thanksgiving! Your food all looks marvelous…and who’d believe that was your first turkey? 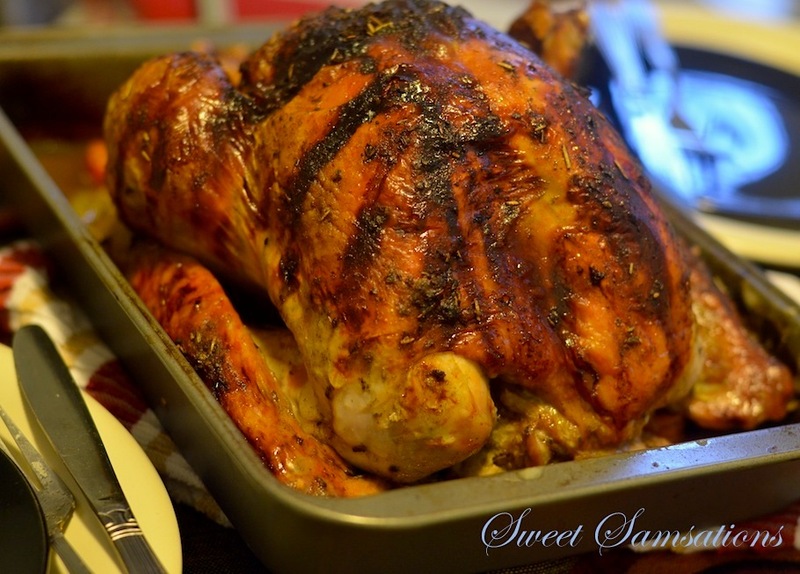 You roasted it like a pro…so gorgeous! Glad you had a great celebration! Its always nice to have good friends to spend the holidays with when you are far away from family. Your Thanksgiving dinner sounds wonderful!! Beautiful turkey! You sure outdid yourself. Basting with maple syrup, that’s a sweet idea. Fried Chicken outside the Southern United states of america. meat the flavors and coating will cover a greater amount of the meat’s surface offering more of these flavors per bite. 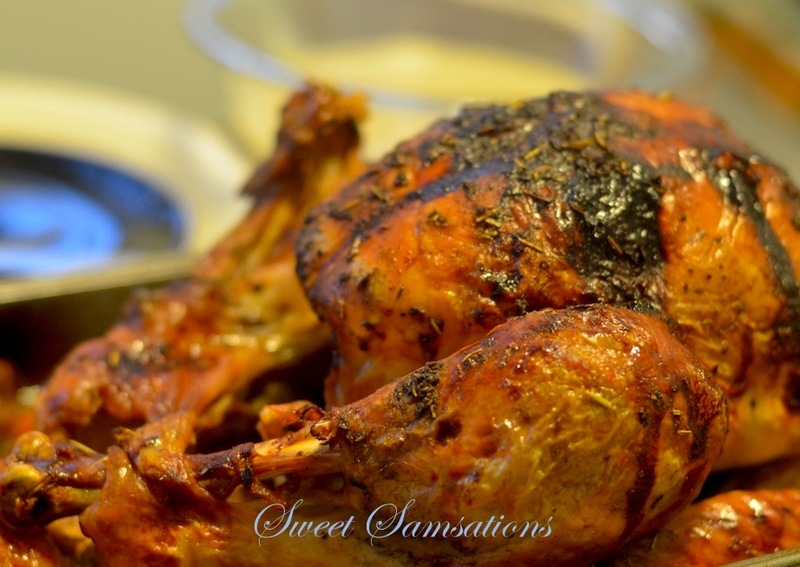 The final decision to use a roasting method to cook the chicken is a good one because this type of cooking will allow us to compose the item in one large single batch and place them on sheet pans for the oven.